Al Tompkins and Roy Peter Clark of Poynter argue in separate pieces that news organizations should identify mass killers, rather than withholding their names and photos from publication. I admire both men greatly and have featured Roy’s writing insights in this blog. But neither of them is at all convincing here. Most journalists and news organizations have not embraced my call to stop giving attention to attention-seeking mass killers. However the Sun News Network has decided not to publish the name of the suspect in the recent New Brunswick slayings of three police officers. The Sun News decision prompted Al to address the issue and Roy was agreeing with Al’s post. Please read Al’s and Roy’s responses to this post, at the end of my original post. I am participating today in the National Summit to Fight Plagiarism and Fabrication. For the past few months I have been working with an outstanding group of colleagues on an ebook, Telling the Truth and Nothing But, intended to help journalists and newsrooms prevent plagiarism and fabrication. Craig Silverman, whose Summer of Sin blog post set this summit in motion, and who contributed to the work of the book. Teresa Schmedding, American Copy Editors Society president, who answered Craig’s call for journalism organizations to take this issue on and invited leaders of other organizations to join ACES in the project. William Connolly, retired New York Times copy editor, who led the project. I was pleased to represent the Online News Association and Digital First Media in the project and applaud the others who contributed (who are listed at the back of the book). 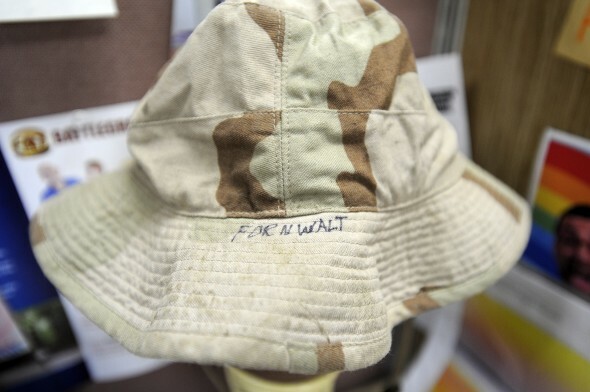 Jason Plotkin, an extraordinary (Emmy-winning) visual journalist for the York Daily Record, blogged recently about a marine giving him his “Cover” (“The Army wears hats. The Marines wear Covers,” the marine explained). Jason wrote about all the gifts he had given away over the years, or passed on to a YDR charity auction, guided by the ethical imperative to maintain independence from sources. His colleague, Buffy Andrews, called the dilemma to my attention, asking what I thought. Here’s what I think: We should absolutely – and insistently, if necessary – politely refuse gifts of significant value that could threaten our integrity, if only by appearance. But journalists don’t have to be assholes. Our jobs too often force us to annoy – asking difficult questions, refusing pleas not to publish embarrassing information, intruding on grief and other private situations. I defend (and have practiced) all of those actions and many other unpopular things journalists need to do. But we don’t have to insult people who are being kind in ways that don’t threaten our integrity. My #twutorial series hasn’t been updated since late October, but I always planned to do a post on verifying information gathered in social media. Given the errors some journalists made in reporting on the Sandy Hook massacre and in the original reporting on Manti Te’o’s fake girlfriend, this feels like a good time to stress accuracy and verification.